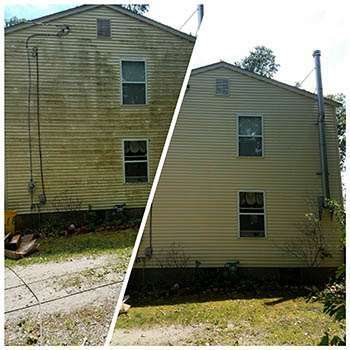 Soft Washing is a low-pressure washing solution to washing your home as opposed to a high-pressure power wash. Power washing using high pressure on your home can leave irreversible damage costing 1000’s to repair. 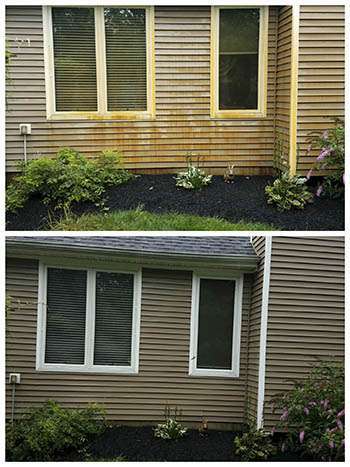 The Soft Wash solution takes the pressure out of power washing using low pressure to clean your home. Soft Washing consists of our professional crew applying our professional-grade soaps and detergents that do the work for us to fully kill all of the green algae, mold, mildew, pollen, and bacteria that builds up naturally on your home. After a few minutes of our soaps and detergents doing their job, we will wash everything away with a little more pressure than a garden hose as to not cause damage your home and bring back its natural beauty. Soft Washing is not only safe for your home but is also safe on all landscaping with proper care. Nothing makes your home have that “Fresh” new look like a good concrete power wash. Wash away all the years of dirt, grime, mildew, and algae with our professional concrete pressure washing services. 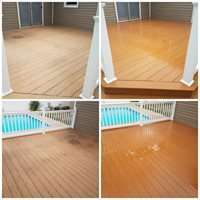 Restore your deck back to its natural beauty. Like our house washing, we use a low-pressure washing, “Soft Wash”, solution to deck cleaning as well. 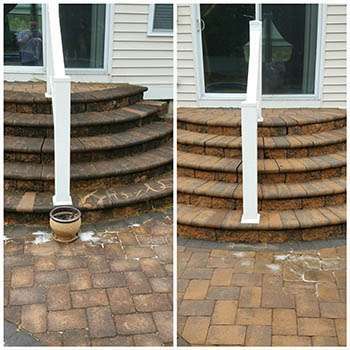 High Pressure can cause damage to any type deck so we use our low-pressure SoftWash to remove all of the algae, bacteria, mildew, mold, and grime from your deck so you can enjoy the spring and summer time on your beautifully cleaned deck. Rust on your home or concrete is a direct result of high iron content in your water system. This is more prevalent in homes that have well water. Rust is a definite eyesore and can be challenging to remove. Top Notch Pressure Washing uses top on the line rust removal products and techniques to help make this process simple, effective and cost-efficient. 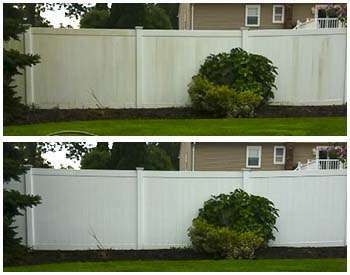 Spruce up the outline of your property with a nice “Fresh” looking fence. Whether it’s vinyl or wood, we specialize in making all fences look beautiful again with our low-pressure washing, “Soft Wash” process.